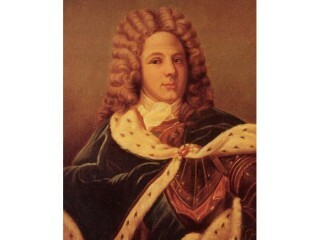 The French writer Louis de Rouvroy, Duc de Saint-Simon, provides in his classic "Memoirs" a major source of information on the court of the "Sun King," Louis XIV. The Duc de Saint-Simon was born on Jan. 16, 1675, in Paris. As a young aristocrat, he studied horsemanship and fencing as much as letters and entered the elite King's Musketeers at the age of 16. Three years later, apparently inspired by the memoirs of Marshal Bassompierre and others, which he read in the field, he began making notes for memoirs of his own. Passed over for promotion in 1702, Saint-Simon abandoned his military career and went to live at the court of Versailles. He apparently continued to make notes and read extensively in the works of other memorialists and historians, to the point that his fellow courtiers often consulted him on questions of history, genealogy, and court etiquette. However, both his resignation from the army and his sometimes unwelcome knowledge of court traditions irritated Louis XIV, who excluded him from any official post for the rest of his reign. After the death of Louis XIV in 1715, Saint-Simon played an important role as public and private counselor to the regent, Philippe II d'Orleans, retiring upon the death of the latter in 1723. After spending several years on such other historical projects as his Notes on the Dukedoms and Peer-ages and his Additions to the Marquis of Dangeau's Journal, he began revising and writing out his Memoirs in 1739. In the Memoirs, Saint-Simon's observations allowed him to describe vividly both the elegance and the corruption of the court of Versailles. Despite some errors of fact and interpretation, his knowledge of history made him aware of the breakdown of traditional checks and balances that underlay Louis XIV's royal absolutism and which was to lead, in the next century, to the French Revolution. Saint-Simon's intensely written accounts of court intrigues and such events as the deaths of the Grand Dauphin, the Duke of Burgundy, and Louis XIV himself—as well as his incisive word portraits of his fellow courtiers—make him perhaps the world's greatest writer on the prestige, the ambitions, the uncertainties, and the ironies of public life. He completed his Memoirsin 1752. Saint-Simon died on March 2, 1755, in Paris. View the full website biography of Louis De Rouvroy.